Hi! 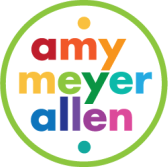 My name is Amy Meyer Allen and I live in Albuquerque, New Mexico with my husband and two young girls. I'm a graphic designer, speaker, author, illustrator, bible study teacher and women's conference leader. If you need any of my services, please click on any of the websites above. If you'd like to hire me as a speaker, please go to my speaker page. Need a logo? How about a website? Want to update your business cards? Click on my graphic design button for examples of my work. Looking for unique gift ideas? How about a children's book of virtues? Click on my Humble Bumbles button to see some of the items I have for sale. Are you struggling in life? Need a way to get connected with God? Is your marriage in trouble? Check out our conference for women, or the Bible study my friend and I co-wrote and teach or find hope for an impossible situation on my marriage website. If there is something I can help you with, please don't hesitate to contact me! Website © 2016 by Amy Meyer Allen. All rights reserved.